Hello! Look at how long it’s been since I’ve visited this blog! Cobwebs everywhere. I’ve got a couple of festival appearances coming up, and I mention them because if you’re in Newcastle or Brisbane, I would absolutely love to catch up with you. Also! 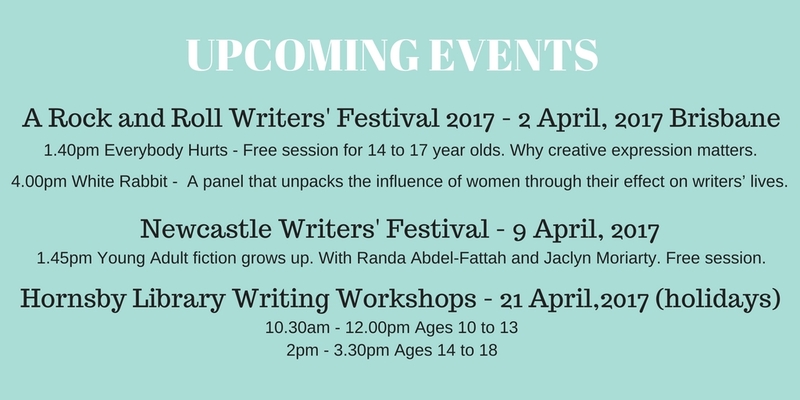 I’m conducting two writing workshops for tens to teens at Hornsby Library in the April school holidays. The library have been ace in letting me have a slightly longer time slot than normal. I love giving workshops – it’s always a huge pleasure to enjoy the really different ideas a room full of young writers can come up with. So if you know any teens you’d think would enjoy it please send them along. They don’t even have to be budding writers. This would also work really well for reluctant readers – it always seems to spark something. Okay, enough from me. Hope you are well and happy and enjoying the Year of the Rooster so far. I might try and blog more regularly (I had grand plans for a regular Friday update, but maybe it’ll be fortnightly).